For many people weight loss and management is a daily struggle. The most important component of losing weight and keeping the weight off is a change in behaviors and thinking. That does not only mean a change in physical behavior but more importantly a change in mental behaviors. We have spent our entire lives developing habits. It is vital that we not only change our physical habits but also the way we think. Without changing the way we think, we are doomed to continue the poor physical habits we have developed over time. The following keys are imperative to making permanent change that will bring about weight loss and more importantly keeping the weight off. We live in a busy world. We all have families, jobs, and responsibilities that make it difficult to eat right. I’m sure you are familiar with the following scenario. You work all day, take kids to activities, end up at home around 6pm or 7pm at night and have no idea what the family is going to have for dinner. And then there is always the conversation with your spouse or family that usually goes something like this: “What do you want for dinner? I don’t know what do you want? I don’t know lets ask the kids. Kids, what do you want for dinner? I don’t know.” This conversation usually eats up 20 or 30 minutes of your evening just trying to decide what everyone wants. And even if someone does have a suggestion, it is not what everyone else wants and you start at square one again. The easiest solution, order out or go out to eat. Now I’m not saying going out to eat has to be unhealthy. But let’s face it, it is much more difficult to eat out in a healthy manner. And often when it is late in the evening, fast food is an easy and quick solution. Typically when we are rushed, we make poor choices when it comes to meals. In order to make better choices, it is vital that you plan ahead for meals. In fact, I recommend you make a menu for each week. Work on the menu on the weekend when you have some time and plan your meals for the entire week. At our home, we post the weekly family menu right next to my son’s school lunch menu and it works just the same way. You don’t have to think about what you are going to eat when it is time or past time for a meal. The menu is posted and you know exactly what to make without having to think about it or have a family meeting. The other thing that a menu will do is allow you to grocery shop for the correct items. Grocery shopping is one of my least favorite things to do. We have all experienced the shopping trips when you meander down the store aisles just picking up things that look good (especially if you shop when you are hungry). One or two days later you realize there is nothing “good” to eat at home. If you have a menu with detailed items, you can make a proper shopping list for exactly what you will need and will make your next trip to the grocery store a productive one. Ensure you are eating the proper portion sizes at meals. This at first glance can be difficult. Serving sizes of meals at restaurants has grown tremendously over the past 20 years. In fact, the serving size at a typical sit down restaurant is at minimum more than double the recommended calories for one meal. Fast food takes it to another level. A large order of french fries contains as much as 1,000 calories. Add a burger and soda to that and you are consuming over 2,000 calories in one sitting. A study published in 2012 found that 96% of restaurant meals exceed USDA recommendations for fat, salt and overall calories. The NYC Health Department found that serving sizes for common food items has grown since the 1980’s. For example, a serving size for a bagel was 180 calories in the 1980’s but now the average serving size for a bagel is 350 calories (more than double). Did you also know that the average size of plates, tins and pizza pans has grown over the last 20 years as well? So even when eating at home, a serving size can be deceiving. If you are eating out, a good rule of thumb is to eat half of your meal and save the other half for a later meal. If you are cooking at home, be aware of the amount of food you are making. There are some helpful tips when cooking at home. A) Do not bring the full portions of cooked food to the table. Bring only the plated portions. This makes it easier to avoid 2nd helpings and over eating. B) Use smaller plates. I know this may sound simplistic. However, our brains are trained to see a full plate of food and recognize that the full plate is what we need to be satisfied. 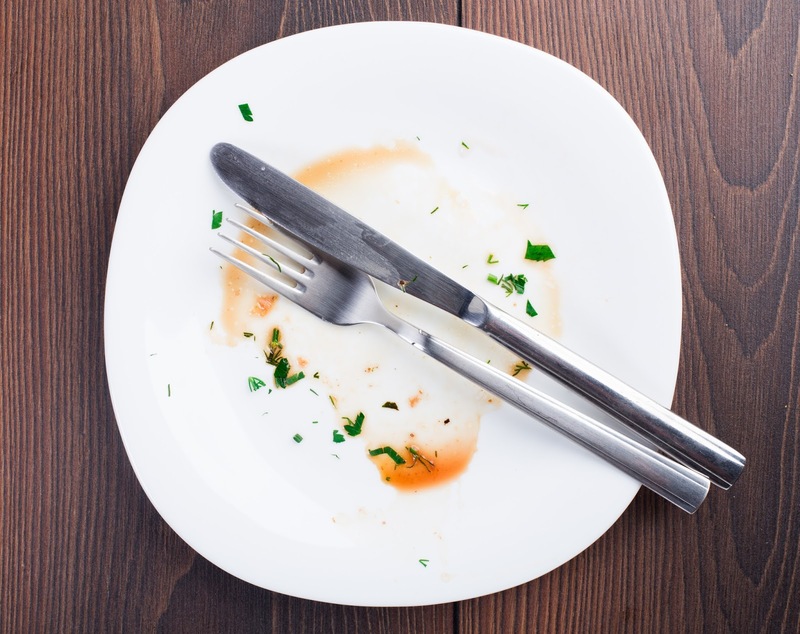 By using smaller plates, you are re-training your brain to be satisfied with lesser portions. C) Always leave some food on your plate. If you are like me, I grew up in a household with parents and grandparents that had a rule. That rule was “finish what is on your plate”. That training from childhood stays with us and is a difficult habit to break. There is no rule that you must finish everything that is put before you. Always leave a bite or two left on your plate and be okay with that. D) Eat more slowly. I have a son who is now 14 years old. When he was a baby, I started a very bad habit of eating as quickly as possible. Those if you who have had children are probably very familiar with this habit. When you have a baby, you might have an hour to eat but more likely, it is minutes at most. Even now that my son is well beyond needing constant attention, from time to time I find myself falling into the habit of eating as quickly as possible. Take your time when you eat. Enjoy the taste of the foods you are eating. Chew more slowly and deliberately. Put your utensil down after every bite you take. 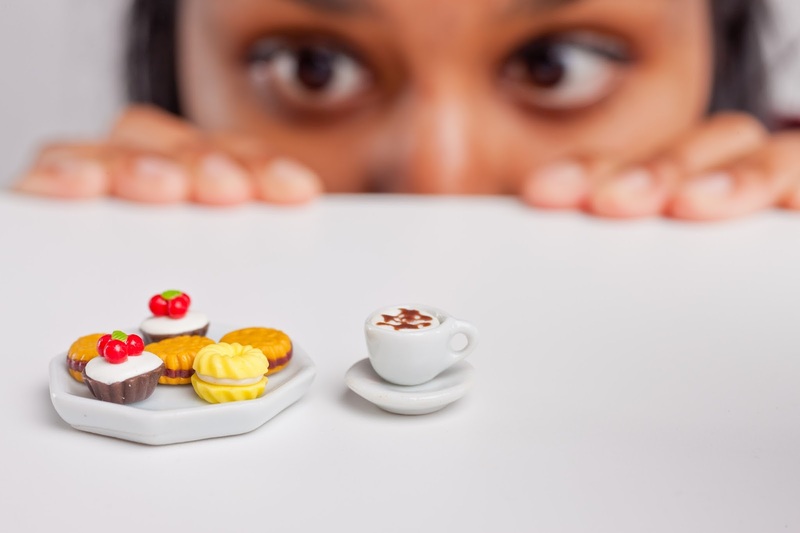 All of these things make your mind more aware of the amount of food you are consuming. E) Stop eating when you feel good. There is fine line between being satiated or satisfied and being full. Most of us ignore our body signals that we are satisfied and instead push through those signals until we are full or even stuffed. We all know that post Thanksgiving meal feeling of being stuffed and bloated. Our body is telling us that we overdid it and the feeling is not good. Learn to listen to your body signals and stop eating when you are satisfied. With time and repetition, you will learn just when to stop eating. This tip sounds counterintuitive. If you want to lose weight, it seems like it would make sense to skip meals thereby reducing your calorie intake. However, this has just the opposite effect. When you skip a meal your metabolism slows down and your body naturally burns less calories. Often what happens if you skip a meal or even two meals is when you finally do eat, your hunger is so great that you over indulge and take in more calories and often with less healthy food choices. At some point hunger takes over your rational decision making process causing you to make poor choices. Usually when people skip meals, breakfast is the first meal to go. This is counterproductive as eating breakfast helps your body regulate your blood sugar levels. Eating a small, sensible breakfast will help you curb hunger throughout the day. When you have fueled up with a healthy breakfast, you are less likely to reach for the junk food or other unhealthy choices in the middle of the day. Overeating throughout the later part of the day is directly related to weight gain. By eating regular meals at consistent times, your body does not experience the “urge” to overeat or to snack on unhealthy items. Right now in the United States alone there thousands of diet plans available for consumers. Everything from Weight Watchers to Atkins to the “Water Diet”. What do all of these programs have in common? They are called “diets”. Just the term diet infers that there is a beginning and an end. Anytime anyone is participating in one of these programs they say “I’m on a diet”. Psychologically when someone goes on a diet there is an expectation that the diet will end at some point. While a diet may lead to weight loss, if you do not continue the diet permanently, the weight will come back. Instead of focusing on the latest fad diet, you need to make permanent lifestyle and mental changes. The changes must be permanent to lead to lasting weight loss and weight management. In fact, I recommend to all of my clients who come to me for weight loss hypnosis to avoid focusing on scales and pounds. If you weigh yourself every day to track progress it is sure to discourage you from your ultimate goal. The human body weight fluctuates. When you experience weight fluctuation it is natural that you will feel worried. If you are following a healthy eating plan and you are bound to see weight gain at times. 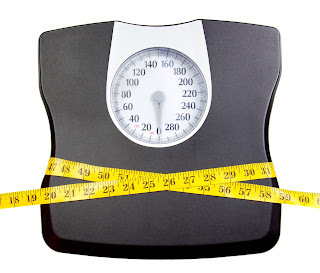 Extra weight you see on the scale does not come from an increase in body fat. It can be water, waste products or other substances that are temporarily present in your body. Weight fluctuations can result in temporary weight increase of up to 5 pounds a day. It takes some time for your digestive system to process the food, fluids and salt that you consume and these substances that are still being processed will contribute to your weight. If you weigh yourself daily you will see weight fluctuations that may cause you to lose faith in your weight loss journey. True weight gain and loss is a process that occurs over a longer period of time. Focus on changing eating behaviors and have faith that these changes will result in long term and permanent weight loss. This is probably the most difficult and challenging key to losing weight and maintaining an ideal weight. Just the term “exercise” is intimidating and does not make most of us excited. When we think of exercise, we envision long hours in a hot gym pushing our bodies over and over again. For many of us the idea of even being in a gym is intimidating. The great thing is exercise does not have to be overwhelming or take up hours of your day. There are many things that you are probably already doing that qualifies as exercise. Any time your heart rate increases, you are burning calories. Many easy activities can be effective in burning calories. Walking, taking stairs instead of the elevator, playing with your kids, doing yard work or shoveling snow, walking your dog are all activities that will help you burn calories. Just increase the amount and time of these activities to spend at least 30 minutes a day increasing your heart rate. 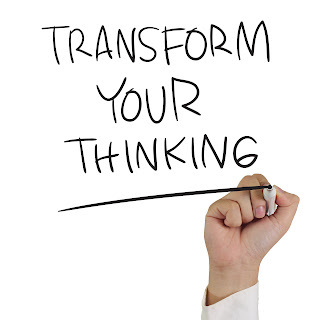 One of the most effective way to bring about permanent changes in behavior is by changing your thinking. Positive thoughts are empowering. A negative attitude can set processes in motion that make losing weight difficult if not impossible. Berating yourself every time you eat the wrong foods, constantly focusing on what you cannot eat and approaching physical activity with dread are all ways negative thought patterns can sabotage your weight loss efforts. If your goal is to lose 50 pounds, that is a daunting task. Instead of focusing on the weight itself, focus on making behavioral and mental changes that will lead to success. As you make these changes in your thinking, the physical results will follow. It is important to encourage yourself and focus on the changes in thinking rather than the actual physical weight loss. As you change your thinking, behaviors will change and the weight loss will just happen. One of the most effective ways to change your thinking is through hypnosis. Hypnosis is very successful when changing thinking and behaviors. 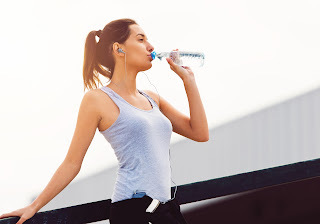 I see clients every day who want to rid themselves of bad habits such as smoking, overeating, excess anxiety and to focus on more positive things like increased confidence, better work and sports performance and overall increased self-esteem. Hypnosis is simply put, a state of relaxed body AND mind. Many of us know what it is like to relax our bodies but the mind can be much more challenging. We have all had that experience of lying in bed at night, your body totally exhausted and ready for sleep. But the gears in your mind just keep churning and you find it difficult or impossible to fall asleep. Hypnosis bypasses the conscious mind and taps into your subconscious mind where all of your habits (physical and mental) are stored. You have spent your entire lifetime establishing habits both physical and mental. When we only focus on changing the physical and ignore the mental, we are doomed to fail. Anyone who is curious about hypnosis probably wonders if he or she can be hypnotized and if so how it feels. Surprisingly everyone experiences hypnotic states daily. If you have ever been driving and find yourself arriving at your destination and have no recall of how you got there you have experienced a state of hypnosis. If you have ever been so engrossed in a movie, book or TV show that you are unaware of anything else that is going on around you, you have experienced hypnosis. Every night when you go to sleep and in the morning when you wake up, you are passing through the Theta Brain Wave state which is where hypnosis occurs. Begin today! Today is the first day of your changed way of thinking and resulting weight loss. Be excited. Be motivated. Be successful!! David R. Wright MA, LPC, NCC is a Certified Hypnotist, Licensed Professional Counselor and National Certified Counselor. He is the owner and Clinical Director of Counseling and Therapy Associates, an outpatient mental health clinic in Taylor, Michigan (a southern suburb of Detroit). He also performs hypnosis stage shows all over the country as the Motor City Hypnotist. Hypnosis As A Golf Cure-All?